How well is your paperwork organized? Is it a struggle just to open your filing cabinet? Are papers scattered all over your desk? Then you need to get organized. 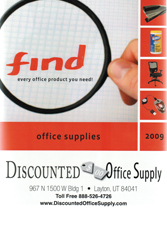 Discounted Office Supply.com-your online retailer of janitorial and office supplies-carries a large selection of file folders, index cards, file fasteners and more to get your organization started. We pride ourselves on offering you a huge selection of filing supplies and cabinet hardware at great prices, with superior service. We’ll ship your order quickly from one of our 36 geographically based U.S. distribution centers. Browse the categories below for the index cards, file guides, file pockets and more that you need. Order today!